In this 6-part series, we will be addressing all things ‘strategy’ with fortnightly updates from our dedicated Strategy team. Stay tuned for their breakdown of ‘PRISM’, where they will be taking us step-by-step through their approach on optimising: Perspective, Reporting, Information, Skills and Measurement within an organisation. Over the past decade, the role of data and analytics to unlock business opportunities for competitive advantage has become much more prominent. Fueled by a rapid growth in data capture, increased sophistication and maturity in approaches to analysing data and the technical advantages in processing, storing and mining data, there has been increased desire to view analytics as a corporate asset, with some accompanying hype around things like AI, machine learning and deep learning. Staying ahead of the competition and being ready to harness data to generate insight that supports business and commercial growth opportunities is a significant challenge. Working out the exact things required to accelerate analytics maturity can often seem like a daunting task – where do you begin? Whenever I have the chance, I try to support my local football team – Often I will walk away from the stadium after a crushing defeat filled with some hope for the next match. Regardless of who we are playing, there will be a game-plan, a set of tactics deployed to make best use of the skills and capabilities available. Sometimes, we might even win – either way, a set of pointers might indicate how to approach things better next time. Of course, every other team is thinking the same core thoughts! So too then for businesses, the challenge of making analytics work rests on having an effective strategy that can be deployed. From experience, while data plays an important role in defining that strategy, it’s very much a team sport with other factors – many of which are organisational – playing a pivotal role in turning analytics projects into successful ones. Analytics challenges can arise from tactical need – such as working out web traffic across sites, apps and smart devices through to supporting decisions around how to drive revenue from new product lines or even to work out which new product lines should be invested in. The role of analytics or insight can be to support marketing initiatives, supply chain or operational efficiency or to deepen understanding of service design usage. While the challenges may be diverse, across multiple functional teams or departments across the business, the process of getting the fundamentals needed to support those challenges through analytics and insight often follows a similar format. I mentioned earlier of the clear importance of data in forming an analytics strategy – from thinking about technology / vendor choices, to pulling together an increasing myriad of data sources to meeting the challenges of compliance and regulation (e.g. GDPR) an effective data strategy for analytics is key. Data is vital, but it’s just one of five key dependencies for successful analytics. Another key dependency is culture – investing time to understand how your organisation integrates analytics into core decision-making. What blockers prevent data-driven decisions, what siloes stop analytics insight being passed or shared across teams? It’s about developing the right workflows and business processes so that analytics is allowed to flourish and insight gets shared across all levels of the business. Just like good marketing delivers the right message to the right consumer at the point of need, so too good analytics will support decision-making to the right stakeholder at the right meeting with the right insight. Reporting is a key driver for analytics success and it’s important to consider how results are shared, how analytics experts share complex topics with business owners from data definitions through to complex visualisations – telling the story effectively is a complex skill! Data science is a buzz-word that does not go away. A lot of businesses strive to hire a data scientist, a star player who can connect all the dots and provide swift answers to difficult challenges by analysing data and providing results in a business-focussed context. In reality, getting the right mix of business analysis, data mining and statistical skills requires a people strategy that compliments the overall aims for analytics. Each business will have specific needs and focus which will shape the types of skills (people) needed and how those are distributed across the wider team. While operating across teams, an analytics strategy, at its core, has people delivering key parts of that strategy. A coordinated and structured approach to developing greater analytics maturity through a strategy inevitability introduces change. Connected to the people plan, thoughts then turn to change management and how to bring colleagues alongside in that journey – it’s about winning hearts and minds as well as building core analytics infra-structure. Getting that right helps to unlock innovation. It’s important to remember that every business is unique, with unique challenges and expected outcomes from analytics. Naturally, there are different capabilities across each of the five ‘areas’ above. By focusing on a strategy that brings together these five areas – culture, reporting, data, skills and data science we’ve seen companies genuinely support long-term business goals through good use of analytics. 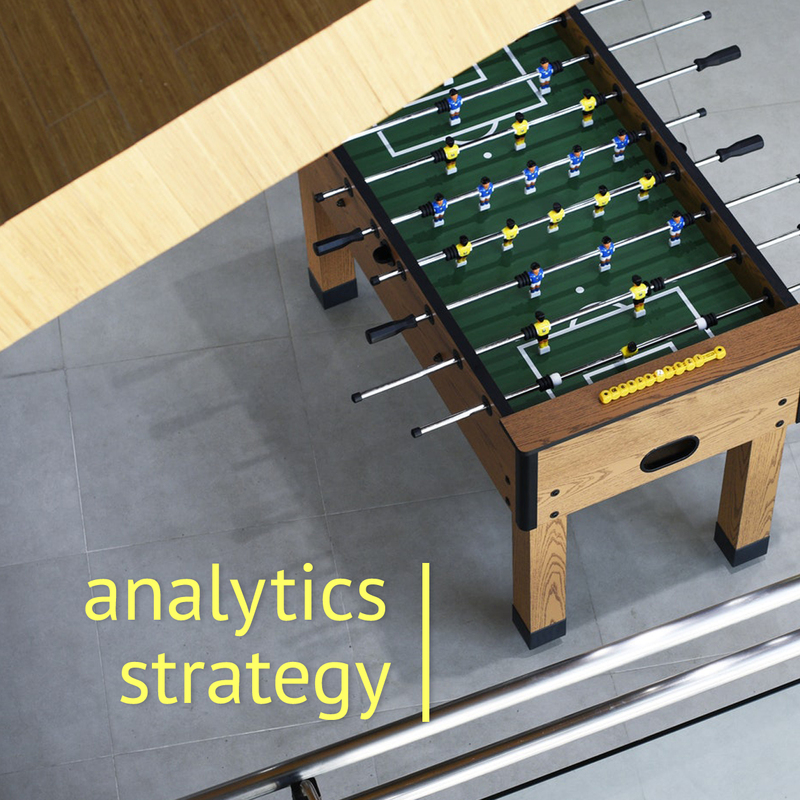 Building a strong foundation for analytics is definitely a team sport – it’s not just up to data scientist or technology experts to deliver insights from data, but it’s the responsibility of the whole of the business to understand how to apply analytics to solve important challenges from tactical quick-wins to longer-term business plan objectives. Follow us on LinkedIn and Twitter for updates about our next blog, where we will be discussing the significance of ‘Perspective’.